Pendulum EffectOnce per turn, during the End Phase, if your opponent activated a card or effect this turn that targeted 1 “Odd-Eyes” Pendulum Monster you controlled (and no other cards) while this card was in your Pendulum Zone: Special Summon this card, and if you do, place 1 face-up “Odd-Eyes” Pendulum Monster from your Extra Deck in your Pendulum Zone, except “Odd-Eyes Persona Dragon”. Monster Effect Once per turn (Quick Effect): You can target 1 face-up monster on the field that was Special Summoned from the Extra Deck; it has its effects negated, until the end of this turn. Okay, got that out of the way (just a fan, not a gameplayer). Odd-Eyes Persona Dragon takes a more direct and forceful approach in terms of being a Pendulum and a monster. In the End Phase of a turn your opponent targeted an Odd-Eyes Pendulum you control you can move this guy to the monster zone and replace it with an Odd-Eyes from your Extra Deck. Incredibly useful to keep your zones filled for Pendulum Summoning, nets you a monster on the field to gain presence (1200ATK isn’t much, but 2400DEF is), and now you’ll get to benefit from OE Persona’s effect as a monster. A Breakthrough Skill effect for a Extra Deck monster can stop so much and help gain advantage. You have a free negater on the field during your turn, preventing your opponent from using Extra Deck monster effects for that turn (for whichever monster you select). Your Pendulum Zones will likely be filled, so Pendulum Summon and get some high ATK monsters to help Persona out. The one thing holding this card back (beside its low ATK) is that to get the full use out of it’s Pendulum Effect, you need an Odd-Eyes Pendulum Monster in the Extra Deck. Leading off with this guy isn’t the best thing, especially with its Level 5 stopping you from Normal Summoning it. There are ways to get a Pendulum into the Extra Deck quickly though, and once that happens you’ll be ready for when your opponent eventually targets an Odd-Eyes Pendulum monster. The monster doesn’t have to be on the field so as long as it was the only card targeted, you are free to fire off. The effects are better than yesterday’s card, but the stats are way worse. Odd-Eyes Persona Dragon is a Level 5 Dark Dragon-type Pendulum Monster with 1200 Atk and 2400 Def and Scales of 1. This is a mandatory low scale for the deck, but the Pendulum Effect only really does anything in the End Phase. And again, you only get to even use the effect if there is an Odd-Eyes monster face-up in your Extra Deck. That’s restrictive. The monster effect is much more useful. It doesn’t need to be Pendulum Summoned to be able to negate a monster effect of an opponent’s Special Summoned Extra Deck monster once per turn. It’s a shame this can’t be Normal Summoned without a tribute, but the stats and the effect scream defensive options. So better, but still not great. 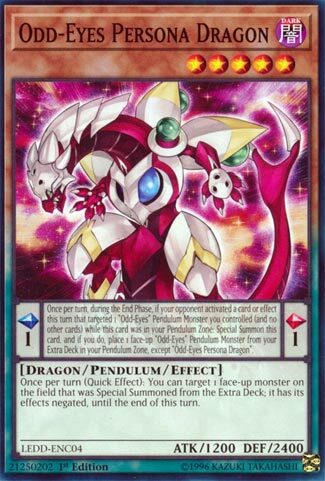 Another card in the Dragon Decks that is finally playable in Europe, this time a former Jump Promo, we got Odd-Eyes Persona Dragon. Persona Dragon is a scale 1, which is always outstanding, leaving the possibilities for your Pendulum Summoning nearly endless as long as you have a high enough scale on the other side. In the Pendulum Zone, if your opponent targeted 1 Odd-Eyes Pendulum Monster you control, and nothing else, you can summon this card from the Pendulum Zone and if you do, you can place an Odd-Eyes monster face-up in the Extra Deck to the Pendulum Zone. Nice to have an option to reuse Odd-Eyes Pendulum Dragon or get your Odd-Eyes Arc Pendulum Dragon back, plus this goes to the monster zone, and he has a great effect. Once per turn, during either player’s turn, you can target one monster your opponent controls that was summoned from the Extra Deck, and negate its effects until the end of the turn. So many powerful monsters in the game today come from the Extra Deck, to shut down their abilities can win you the game. With it being a great scale, easily searchable, and having a good effect, this card is mandatory in the Odd-Eyes deck. If it was Level 7, it would be better, but Level 5 is good enough. Odd-Eyes Persona Dragon is an interesting little card. Level 5 with only 1200 attack (but sporting a beefy 2400 defense) and being a 1 on the Pendulum scale, make up for the low attack, in my opinion. The first effect on the Pendulum side is good. A little specific in requiring a specific target ONLY, but pulled off, grants you a free Monster, a +1. Though I feel the Monster effect is where Persona Dragon truly shines. It enables you to Target a Monster Special Summoned from the Extra Deck, and have its effect(s) negated until the End Phase. That’s a useful, and rather nifty ability, to help you get around most obstacles you’re going to face. Said effect can be used during either player’s turn also, only adding to the strength of this card.